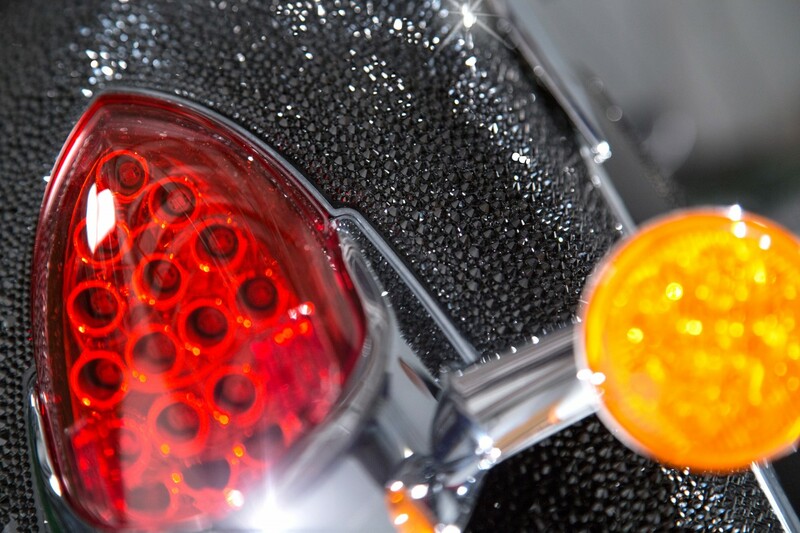 An up and coming singer has covered an Indian Motorcycle Chief Classic from headlight to tail in Swarovski Crystals, each one painstakingly placed by hand. Angelica Ganea hopes to sell the motorcycle later this year to raise money for charity and to help fund the recording of her music CD (called Sacred) and publish her new book. 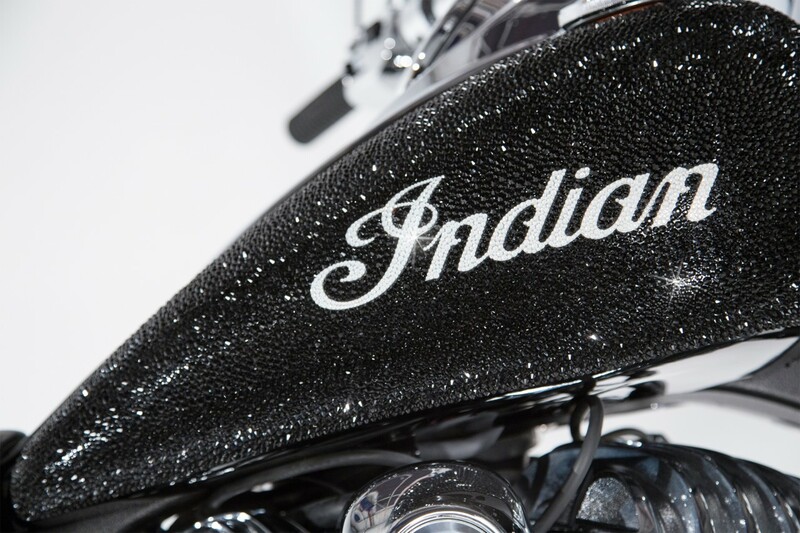 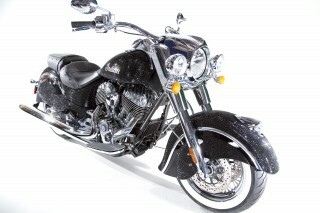 The ‘Crystallised Indian Motorcycle’ as it’s been called, is actually a 2014 Chief Classic and has close to 200,000 Swarovski crystals glued on to it. Video here. 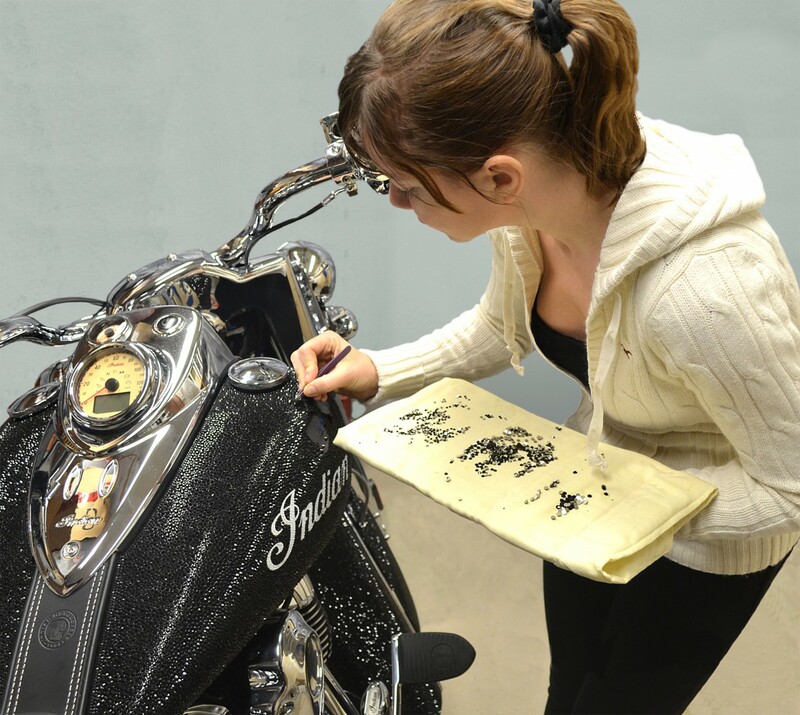 It has taken Angelica Ganea close to 1,500 hours to complete the Crystallised Indian Motorcycle , saying that she did it “for her music”. 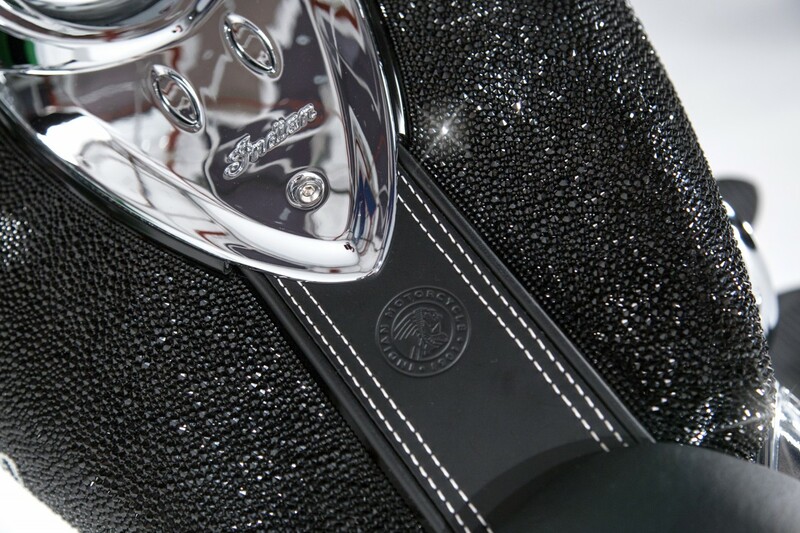 Angelica Ganea started singing at the age of 6 and at 19 she won a national singing competition in her home country of Romania. 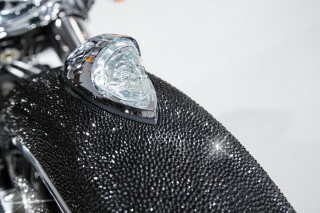 Her love for crystals, sequins, beads and all things sparkly started when she was a child. Her particular take on bling wasn’t easy considering the availability of materials in Romania at the time. 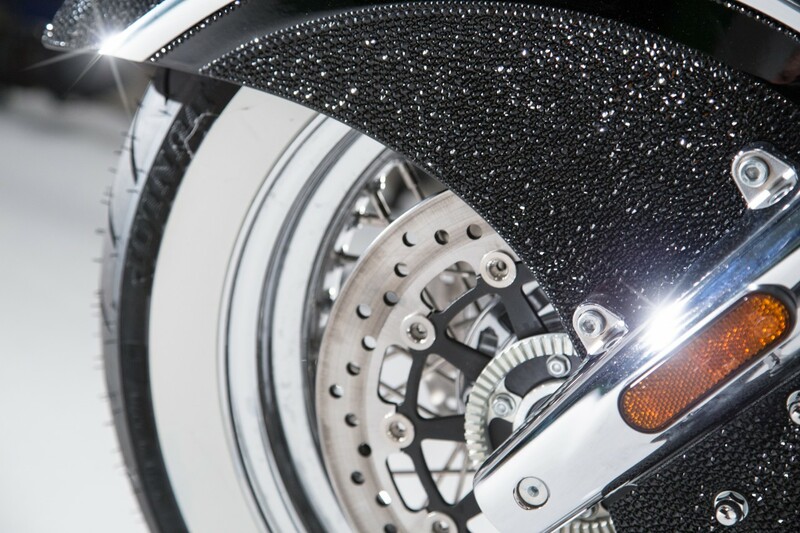 She jokes that her customisation of clothing and music equipment “didn’t burn down her father’s garage”, but she did cut up her mother’s burgundy velvet curtains to make a dress that she then wore on stage to sing in. When she was older, she moved to Canada and this is where she started to use Swarovski Crystals in her stage outfits and shoes. 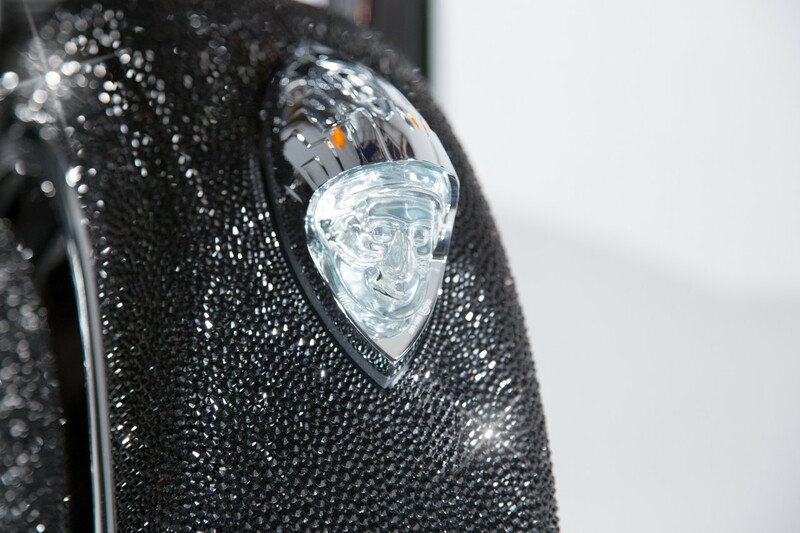 She took it even further by crystallising microphones and musical instruments and even making custom monogram cake toppers. This led her to start up a company called Emporium A to offer her services to others and very soon, because of the high quality of her craftsmanship, she became a Swarovski Branding Partner. 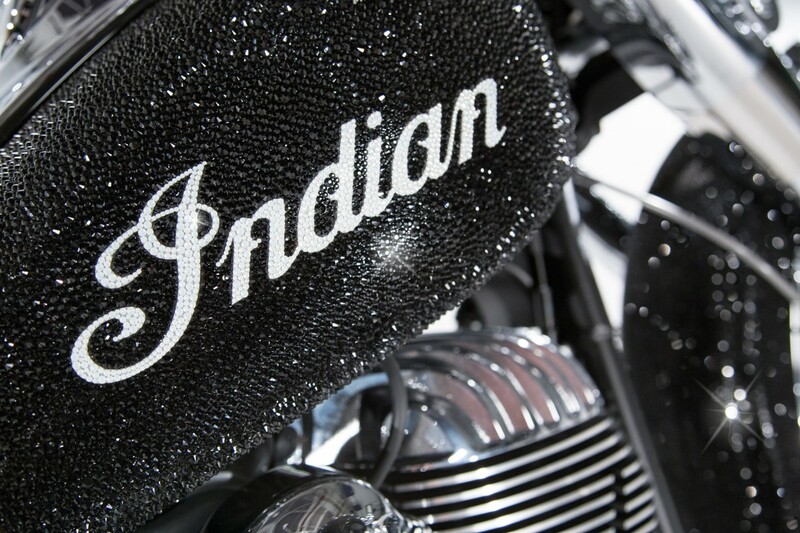 Confident in the quality of her craft, Angelica then decided to tackle a much larger item and this is where she had the idea to cover a motorcycle, but not just any motorcycle, but an Indian Chief Classic. 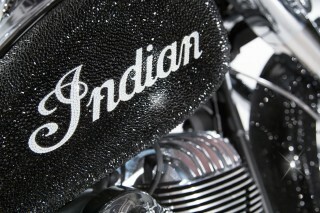 The Chief Classic has become one of the best-selling models for Indian Motorcycle since the brand was re-launched by parent company Polaris. 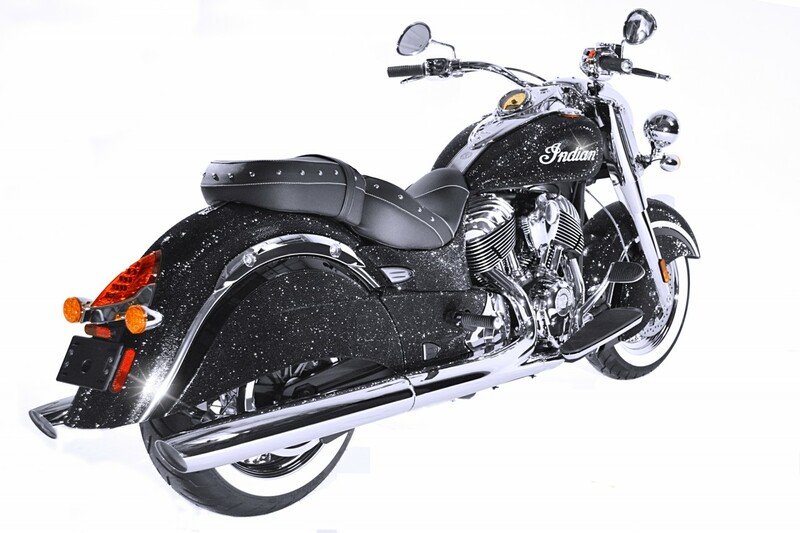 This particular model is finding favour with modern-day riders who crave a machine that has heritage, rustic appeal and American beauty. With guts, faith and sheer determination, Angelica Ganea has pulled off the Crystallised Indian Motorcycle and has created a one-of-a-kind motorcycle that has people in complete awe.